Voicemail, "It's In The News", "Tweet Me A Question" and Bab's Butterfly. That blue-cheese-artichoke-heart dip was delicious and decadent, and if Paula Dean risked diabetes to create the recipe, it was worth it! I don't think fat greasy food gives you diabetes, I think it's too much sugars, high fructose corn syrup, that sort of things. Fayutt food is more dangerous in terms of heart attack and stroke, except that it can make you overweight which in turn increases one's risk for type 2 diabetes significantly. 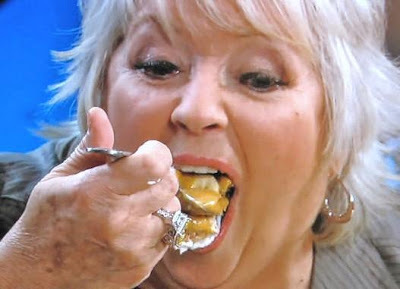 I only know Paula Deen from her appearance on Kathy Griffin's reality show, but I don't think she's that obese (frankly, I've seen worse). However, at least Bradley Traynor pointed out on his radio show that it's in poor taste to only "come out" as a diabetic because she announces an endorsement for a certain drug company's diabetes medication.